As I read artist statements, reviews, narrative bios, press releases and even features, I’m often struck by the lack of distinction between and among them. This is not just unskilled writing on the part of artists but of galleries, too (and, sometimes, of lazy or unsophisticated journalists as well). Let’s take a stroll through the ways we write about our work and how that information may be used. If you're not up on your Latin, Caveat Scriptor translates as Let the writer beware. But this post could just as easily have been titled Caveat Lector, because just as we need to think about what we write, we also need to be perceptive about what we read. I covered this topic recently, so let me just say that it’s a first-person document, typically a couple or three short paragraphs, which introduces the artist’s thinking about a particular series or body of work: What it is, why you’ve made it, and possibly how you’ve made it. I advocate including a picture with the statement, all the better to connect your name, work and words for the reader, who may be not just an art viewer, but a dealer, curator, critic, editor, freelance writer or publication-affiliated journalist. What you don’t want to do with a statement is introduce value judgments into the narrative. That’s the critic’s or journalist’s job. So, descriptive, yes: succulent, stringent, complex. Qualitative, no: awe inspiring, thought provoking, powerfully reminiscent of the late work of Louise Bourgeois, and such. The statement will help a gallery write a press release, perhaps give a reviewer insight into your thinking, and very likely help a feature writer, as well as a viewer, understand what you do and why. You don’t write this; a reviewer does. Much as you’d like to tell the reader what to think about your work, or to sing your praises, that’s best left up someone whose job is to think critically about art and to put that critical thinking into a short (or long) and ideally perceptive piece about your work. Make sure you and/or gallery provide the statement and a selection of good images. Do what you can to make it easy for the reviewer—the gallery must be open when the reviewer arrives; a press packet, if not already sent, should be waiting; if there's a catalog, the reviewer should get one—then step out of the way. This is you writing in the first person (or third person) about your career. A short narrative bio tells the reader who you are, what you have done, where you have done it, and when. It doesn’t have to be dry as dust—speak in your own voice, and include the events and achievements you feel are most relevant. Humor is not out of the question. I once noted that I received the “Angry Hillbilly of the Week” award for my blog from a vanity gallery peeved that I had warned my readers about the predatory nature of pay-to-show galleries--and I mentioned that I'd posted news of the award right under a picture of Granny, Jed, Jethro and Elly Mae. Careful with the qualitative descriptions, though. You may think of yourself as the world’s foremost authority on painting, or the most innovative artist to have come out of Yale, but save that for the mirror. The function of a press release is to provide basic information to anyone who might wish to know more about what you’re doing. It should include the journalistic W’s: who, what, when, where. (Why may not be necessary.) Keep it brief, no more than one page. Carolina Miranda, aka, C-Monster, puts it into perspective: "It’s a press release, not a last will and testament." Among the many sensuous pleasures of a painting, perhaps none is as heady as the pigmented ooze of paint itself. 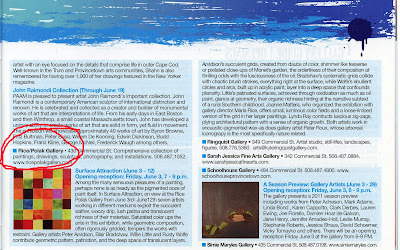 In Surface Attraction, on view at the Rice Polak Gallery in Provincetown from June 3 to 12, seven artists working in different mediums exploit the succulent slather, woozy drip, lush patina and translucent richness of their materials. Saturated color ups the ante, while geometric composition, often rigorously gridded, tempers the works with restraint. Gallery artists Peter Arvidson, Blair Bradshaw, Willie Little and Rusty Wolfe contribute geometric pattern, patination, and the deep space of translucent layers. Arvidson’s succulent grids, created from daubs of color, shimmer like tesserae or pixilated close-ups of Monet’s garden, the orderliness of their composition at thrilling odds with the lusciousness of the oil. Bradshaw’s systematic grids collide with chaotic brush strokes, everything right at the surface, while Wolfe’s ebullient circles and arcs, built up in acrylic paint, layer into a deep space that confounds planarity. Little’s patinated surfaces, achieved through oxidization as much as oil paint, glance at geometry, their organic richness hinting at the narrative subtext of a rural Southern childhood. Joanne Mattera, who organized the exhibition with gallery director Marla Rice, offers small, luminous color fields and a loose-limbed version of the grid in her larger paintings. Lynda Ray contructs luscious zig-zags, plying architectural pattern with a sense of organic growth. Both artists work in encaustic—pigmented wax—as does gallery artist Peter Roux, whose arboreal iconography is the most specifically nature related. Encaustic painting has undergone a revival in the past decade. Surface Attraction, timed to take place during the Fifth International Encaustic Conference in Provincetown, positions this ancient and once nearly extinct medium squarely within the larger context of contemporary painting—here explored thematically through materiality, geometry and color. Additionally, gallery name, location, and hours were provided, along contact info and links to more information. What you can see here is that the press release is more evocative than a statement. It has to be if it’s going to attract the attention of a local or regional press that is inundated with look at me, look at me, look at me, and to entice a reader into visiting the gallery amid the many things that take place at any given time. 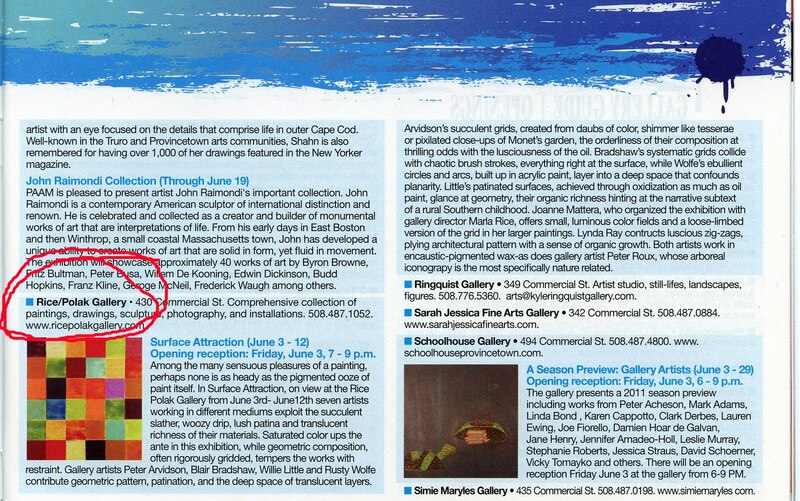 Here’s how I used the info in my own blog post: Surface Attraction in Provincetown. Ideally a writer will take the information you provide (from any or all of the previously described entities, as well as other recent press) and refer to it when writing a feature about you. Since you will have spelled your name correctly and referred to your work correctly (title, year, medium, dimensions in inches, or centimeters when appropriate), as well as provided correct locations and dates for any event, the chances of that information being correct in a final article are greatly increased. Of course a good feature writer will have visited your studio and had a conversation with you, or perhaps conducted an interview over the phone or even online, so that the living, breathing you has interacted with the writer in some way. If you’re lucky, the writer produces a feature that creates a textual bridge between what you have offered and what s/he has perceived. You learn something about yourself and your work via another person’s perspective, and the reader gets a broader view than you or your statement or press release alone could provide. Sometimes an overworked writer or editor from a small publication, working with an impossible deadline, will pull entire paragraphs from your press release. Unlike the listings, where you hope the release will be used as verbatim as possible, in a feature it's lazy journalism (but it's not plagiarism, since the information is offered to the press for informational use). Yes, it's a disappointment to see your own words staring back at you rather than a writer's own thoughts. If you have written a good press release, though, the feature may end up being better for you than if a harried writer dashed off an unresearched piece that’s full of mistakes. But go after a bigger fish next time; you don't want to be the author of your own feature. Bottom line: Understand the difference between and among the various promotional documents you are expected to provide, and provide them well. The person who benefits is you. Thanks Joanne. This is timely for me because I am curating my first show at The Canyon Gallery, Boulder Public Library and have been struggling with the PR. Writing is not my strong suit. Question - how to you send press releases to bloggers? Often I just see a comments area so am not sure how to send a press release. Thanks! Jane: Most bloggers have an email address somewhere on their blog. The ones who wish to be contacted have it posted prominently. But as a blogger who receives a lot of email I can't do much with, I would suggest that you know whom you're sending to. For instance, bloggers who are local or regional to your area might like to know abut your show. New York-based bloggers, not so much. Bloggers who focus on a particular style or medium, wherever they're located, may want to know about your show--people travel. I'd also urge you to create a blog post for the show, if you have a blog; if not, create a blog. Everyone is click, click, clicking through information. Make sure they have a place to land to be able to read about it. A comprehensive and valuable post Joanne. You pointed out a mistake often made by artists when writing a personal statement-- writing as if they are reviewing their own work. It takes a practiced eye to be objective when editing. Thanks also for including a sample press release--you have a wonderful way of writing descriptions about the surface of paintings! Excellent, succinct information Joanne. I'm bookmarking it to use with my students this fall. Send, Send, Send . . .
Marketing Mondays: You Want to Be in an Art Fair? Marketing Mondays: News from L.A.